"I was thrilled that Rachel invited me to be the judge for this round of Cook the Books, because in many ways I identify with the challenge that Kingsolver and her family set for themselves. While working overseas for eight years, I fell in love with many locals foods but also missed the foods I had grown up with. My first attempt at growing my own was in Bogota, Colombia, with a small calamondin orange tree in a pot. It was absolutely beautiful with all the tiny little oranges, and after that I was hooked. I've grown indoor avocado trees in pots that never produced a single avocado, but gave me immense satisfaction that I could actually grow something and it would live. When we settled in our home on a quarter-acre lot in Northern Virginia in 2007, we had a container garden on the deck our first year as we studied the light and where it fell in the yard throughout the day. Then the next spring we dug up a bunch of inedible bushes on the south side and planted tomatoes and basil. Now we've turned about 300 square feet of grass, bushes, and weeds into an edible landscape that we continue to expand. In the spring we get chard, rhubarb, cilantro, dill, chives, and asparagus. Summer brings us blueberries, tomatoes, peppers, basil, oregano, lemon balm, green onions, and tomatillos, which often last well into autumn. The sage, thyme, and rosemary last pretty much year round now. And this year we had our first crop of grapes: muscadines, scuppernogs, concord, and a few other varieties that will produce in a year or so. We also have a few fig, apple, cherry, peach, plum, and pecan trees, as well as an experimental pomegranate in the yard, and some wild persimmons out in the woods behind our house. Just today we got our very first pecan, and we have two indoor Meyer lemon trees with lemons ripening. We've worked hard at this for the past six years, and it hasn't all been a bed of roses (though we grow those, too). We've learned that local pests liked our squash, cucumbers, cabbage, Brussels sprouts, and eggplant way too much for them to be viable crops for us. We did not want to resort to pesticides, so we stopped growing those things. And some years yield better harvests than others. The last two years we've had crazy good crops of tomatoes, but we had a late freeze last spring which killed off the blueberry blossoms and the apple, peach, and plum blossoms. We have to pick some critters off the plants almost daily, and we've lined our fence with chicken wire to keep out the local bunnies, who seem to think of our backyard as their own personal buffet. I cannot credit Kingsolver's book for inspiring us to grow our own; that comes from our families and generations of farming genes. For us, it was the desire to use our bit of land for more than just growing grass and ornamental trees and bushes. We wanted to have more control over what went into our food, and we wanted our children to grow up with an edible garden and awareness of where food comes from and how to prepare it. We take them to pick local apples and visit the farms in the area to get local eggs, honey, pumpkins, and other fruits and vegetables. And we balance that with the things that we like that don't come locally: chocolate, coffee, tea, pasta, pantry items and spices. We shop at Costco, Wegman's, and local markets. Kingsolver's challenge was obviously life-changing for her and her family, and reading about their decisions and how they learned about eating through the seasons and supporting their local farmers was fascinating for me. Each of us makes food decisions based on what we feel is important, what fits with our needs, and what is available. And I think that all of your blog posts illustrate this idea beautifully! I truly liked all of the stories and the dishes you chose to make, and I saved them for future meals. As for a winner, my favorite post comes from Foodycat. I enjoyed reading the story of her journey to local farms in search of all the right ingredients, and love the finished dish with the roasted pork chops and stuffed onions and apples. Congratulations, and thanks for sharing your story, photos, and dish with us! " --Thank YOU Andrea, for the care and time you took in looking over our blog posts about this great book! 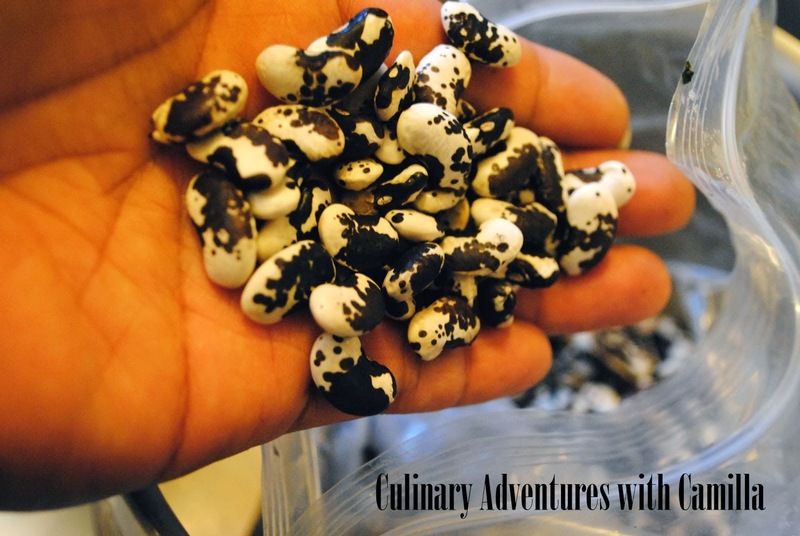 It sounds like you had fun along with us and we really value your input and the story of how you have been expanding your kitchen garden in Virginia. Congratulations to Foodycat for another well-deserved winning post and for giving us a peek at what was available at some local English farms and what happened to all those fresh ingredients in her magical kitchen! 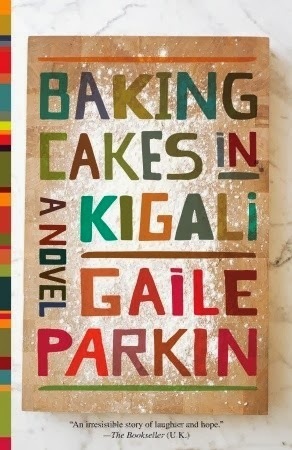 And now, I am turning over the hosting duties to Deb at Kahakai Kitchen who will send us over to East Africa as we read Baking Cakes in Kigali, by Gaile Parkin. I just finished this quiet little novel about about Angel Tungaraza, a Tanzanian matriarch who is raising her five orphaned grandchildren with her professor husband in Rwanda, and also runs her own cake business. New participants are always welcome, so feel free to join our Cook the Books regulars in reading and blogging along with us in December/January. It's an Animal, Vegetable, Miracle Roundup! 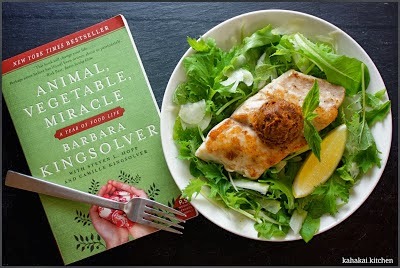 It is so nice to share a book that one loves with others and for this round of Cook the Books, I had so much pleasure in seeing how our band of bloggers took to reading, and in many cases, re-reading, this great volume: "Animal, Vegetable, Miracle: A Year of Food Life", by Barbara L. Kingsolver and Company. Some folks were inspired to rush out to their backyard gardens and pantries of home-grown and prepared foods, while others embraced the locavore message of this book to seek out their suppers from local farmers and markets. 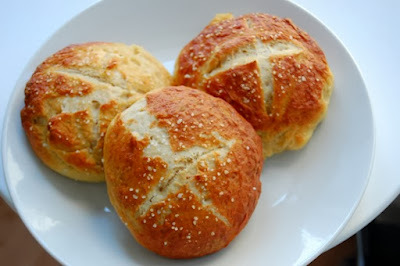 Our book club regulars (and always-invited newbies) hail from around the globe, so it was particularly interesting to me to see what folks would cook up for our virtual feast roundup. Alicia, the adventurous cook behind Foodycat, loved our featured book and roved around the English countryside to procure the ingredients for her "Britain on a Plate" feast of locally grown pork, baked local farm apples and onions stuffed with pork sausage and sauteed cabbage glazed with her home-grown apple jelly. A food still life worthy of a 17th Dutch master painter! I'm always intrigued by the ingredients that my Hawai'ian blogger buddy and Cook the Books Co-Host Deb of Kahakai Kitchen has access to. For her Animal, Vegetable, Miracle post Deb looked to the sea, and came up with a delectable meal of Kampachi, a kind of locally farmed fish, topped with Dried Tomato Pesto blended from an excess of farmer's market tomatoes that Deb previously dehydrated and local macadamia nuts, oil and sea salt. Sounds luscious! Eliot's Eats blogs from somewhere in the American Southwest (I think) from her gardening descriptions. Animal, Vegetable, Miracle was actually the impetus for starting her blog and inspired her to grow and harvest more of her own food. 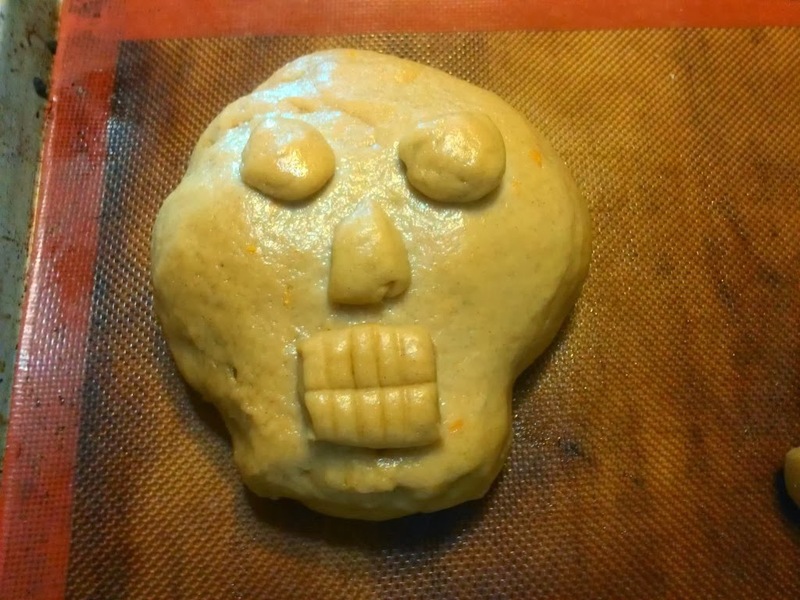 Her post was a very timely one, published on November 1st, la Dia de Muertos, the holiday honored dead loved ones, and she celebrated by making up a batch of Pan de Muertos using locally sourced ingredients and her own homemade butter. 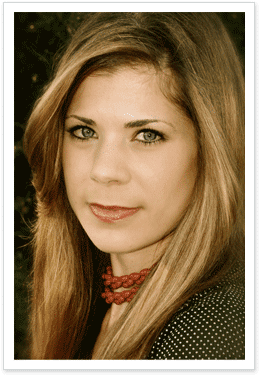 Please join me in welcoming a new participant to Cook the Books, Gwen of Simply Health Family! Welcome Gwen! 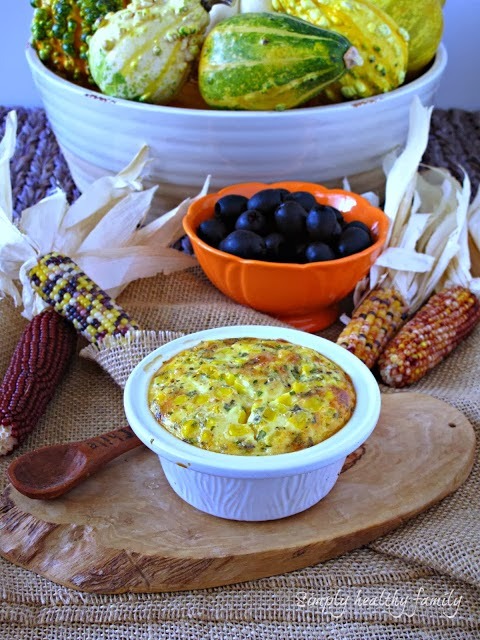 This Arizona native went with a seasonal recipe, perfect for the Thanksgiving table, a Holiday Corn Pudding recipe from Kingsolver's book that was billed as being "so simple a 9 year old can do it". In fact, Gwen's 4 year old was the main sous chef for this tempting dish. My upstate New York garden hung on until the end of October and I had an amazing bounty of hot and sweet peppers. 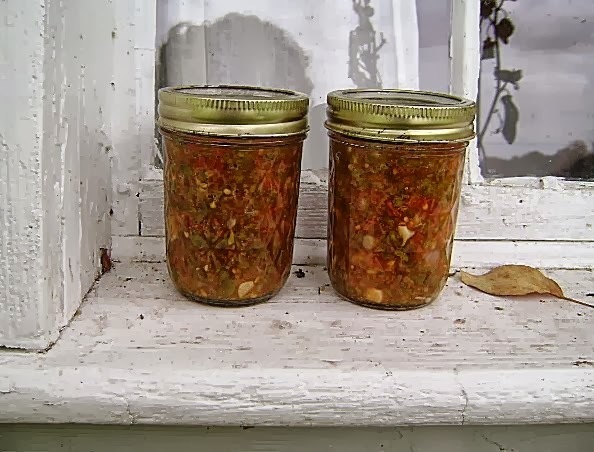 For my Crispy Cook post I canned a couple of half-pints of Jalapeno Relish using a particularly fertile Jalapeno plant for my supply of peppers. This was my first time growing this variety, as I didn't think they'd be very bountiful in my Zone 4 garden, but I was pleasantly surprised. Another Cook the Book welcome is in order for Cathy, of Delaware Girl Eats! She shares a tour of the Bellevue State Park Community Gardens, where she received the wonderful gift of some buttercup squash, a native American varietal, from one of the gardeners. 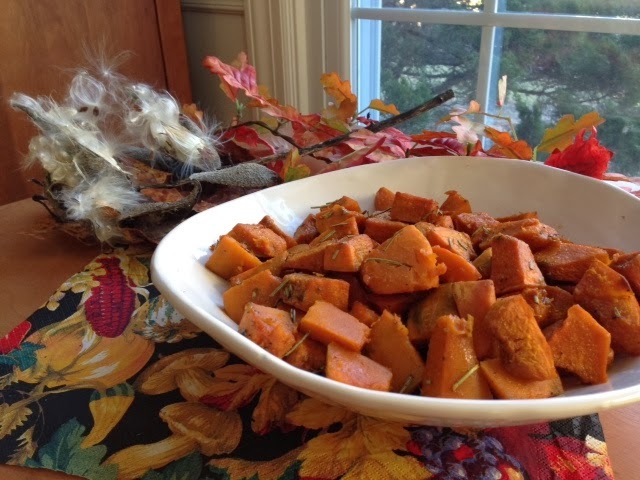 Her recipe for Roasted Buttercup Squash with Rosemary looks sumptuous and elegant. Winter squash is also a passion (she says it's an obsession) for my Indiana blogger buddy and CTB Co-Host Heather, of Girlichef. 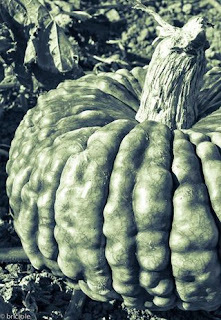 In fact, Heather is in the midst of co-hosting another blog event, 12 Weeks of Winter Squash, if you are looking for ideas to use the seasonal bounty of this great vegetable. 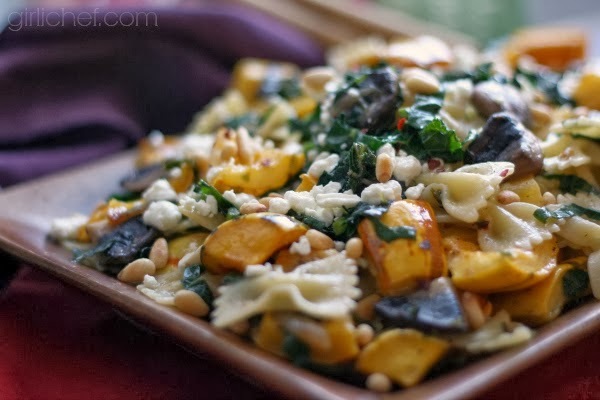 Heather cooked up a bodacious platter of Roasted Delicata Squash and Tuscan Kale Pasta for us to drool over. A third variety of winter squash, this curvaceous Zucca Marina del Chioggia, inspired Simona, another of my delightful Cook the Books Co-Hosts, to use some of its flesh in a loaf of Winter Squash and Whey Bread. You can find this recipe and other great posts on Simona's blog, Briciole, where the Italian native writes about food, breadmaking and cheesemaking in her new California home. I hope that you have enjoyed this survey of wonderful eats inspired by our Kingsolver book selection. Please be sure to visit the links above to see the entire thoughtful and beautiful posts by our participating bloggers. Our Guest Judge, Andrea of Andreas Recipes, will be reading through them and let us know what she thinks next week. In the meantime, you can get a jump on our next book selection, Baking Cakes in Kigali, by Gaile Parkin, which is a novel set in contemporary Rwanda. I just finished it and really savored it; so many ideas, emotions and characters are contained in its pages. Deb of Kahakai Kitchen picked this book (thanks Deb!) and will be cohosting this next round for our December/January reading. Be sure to bookmark some time during the busy holiday season to read this great book! I hope everyone is enjoying tucking into their copies of our current Cook the Books title, "Animal, Vegetable, Miracle: A Year of Food Life" by Barbara Kingsolver, Steven L. Hopp and Camille Kingsolver. I am delighted to announce that the Guest Judge for this round will be Andrea Meyers, a popular blogger, whose seasonal recipes and food photography are really spectacular. Some of you may be familiar with or have participated in her great blog event, Grow Your Own, which featured posts about foods which were locally harvested, foraged, hunted or fished, which is precisely the subject of our featured book. Grow Your Own ran for four wonderful years and you can peruse the archive of roundups at the GYO link here. Andrea has a new feature on her blog, The Farm Project, which highlights the local farms in her neck of the woods, northern Virginia, which you may also want to check out. As a reminder, the deadline for posts that discuss our book and highlight a dish inspired from its pages is November 25, 2013. Let me know that you have published your Cook the Books post by leaving a comment here or at the previous CTB post or by sending me an email at oldsaratogabooks atgmail dot com. Our October/November 2013 Book Pick: Animal, Vegetable, Miracle! The next book selection for the Cook the Books Club is "Animal, Vegetable, Miracle: A Year of Food Life", written by Barbara Kingsolver, her husband Steven L. Hopp, and her two daughters, Camille and Lily, after they relocated from Tucson, Arizona to their new farmstead in Kentucky. The Kingsolver/Hopp family decided on a year-long experiment in which they would try to only buy food from their local community or raise it or grow it themselves. As a longtime Kingsolver fiction fan, I made sure to get my hands on a copy of this book shortly after it was originally published in 2007. I sped through it then, and wrote down lots of notes and dog-eared a bunch of pages of cheesemaking, recipes, turkey-rearing and horticultural tips. I wanted to share this book with others who may not have dipped into it and also thought it would be interesting to re-read this book to see not only how I could renew my efforts to eat more locally-grown foods, but to see how influential it has been on the locavore and farmer's market movements. As always, anyone can join us in reading and blogging about this book by the November 25, 2013 deadline. There are no requirements to sign up or log in to Cook the Books. You just need to cuddle up with our featured book, blog up your thoughts and cook up something inspired by its prose. Oh, and just let me know that you did so by leaving a comment below. Can't wait to see what you think about this great book! 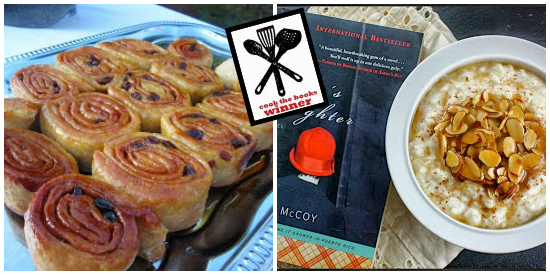 The Baker's Daughter: Two Protagonists deserve Two Winners! with a hot cup of tea on the first truly fall morning in El Paso. an honor to have you as readers, bakers, and new friends. recipe based on it. Bravo, Bea, my wonderful baking reader! 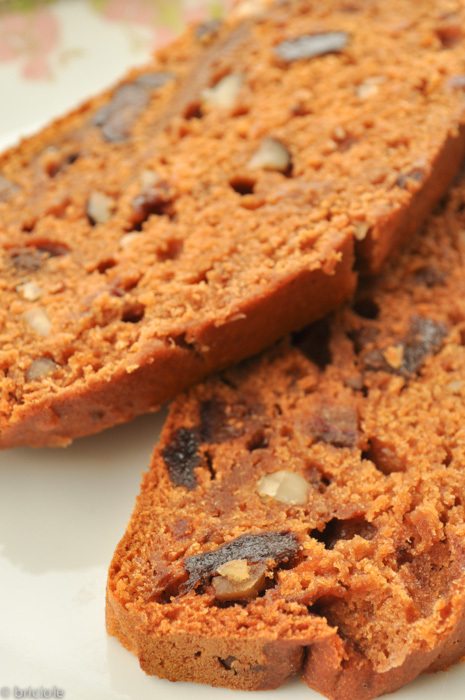 Bienenstich ("Bee Sting"). This entry had me licking my laptop screen. The photographs could’ve been the cover art for a gourmet magazine. Twitter and Facebook, my friends! Be sure to drop by Sarah's facebook fan page as she will be sharing her experience with Cook the Books and some of our creations over there soon! Thanks again, Sarah. As one of the hosts of Cook the Books Club, I have the privilege of choosing our reading selection every fourth time. This is not a task that I take lightly. I know that people are going to spend their coveted free time with whatever I chose - and I want them to enjoy themselves! I always hope that they are able to draw some positive inspiration from what they've read and bring it to fruition in the kitchen. 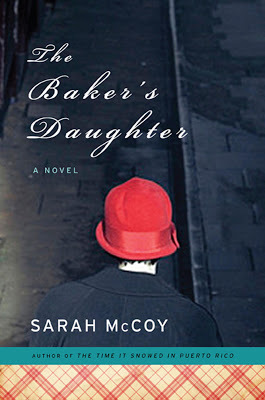 My latest selection was The Baker's Daughter by Sarah McCoy. I've mentioned numerous times that it is one of my favorite foodie reads. The world of early rising and always being enveloped in the comforting scent of dough is something that I find irresistible. For the most part, the other participants seemed to enjoy this book, as well. Some maybe not as much as I did...but hey, that's what makes the world go round, is it not? But no matter their views on the story or the characters, everybody baked/cooked up something mouthwatering in their kitchen. Mission accomplished. Plus, I like to hear others thoughts on a story...the angle at which they approach it. Our life experiences really do shape how we perceive the world (and the stories that make them up). And now I leave the daunting task of choosing a winner for this round to the lovely author of The Baker's Daughter - Sarah McCoy. I can't wait to hear what you think of the inspiration everybody drew from your book! After Sarah's had time to read through the submissions and pick a winner, I will post an announcement. Until then, grab a copy of Animal, Vegetable, Miracle: A Year of Food Life by Barbara Kingsolver, and start reading. Rachel is hosting the next (current) round of Cook the Books with this title; entries will be due November 25. Our selection for this round is The Baker's Daughter by Sarah McCoy. I chose The Baker's Daughter because after reading it last year as part of a book tour, I fell hard. It's one of those books that I want close by...on my living room bookshelf so that it is easily accessible on a rainy day or a sleepless night. This is the tale of family, love, loss, and life lessons. Be it the tale of Elsie Schmidt risking the life of her and her family upon discovering a Jewish child on the doorstep of her family's home and bakery in 1945's Germany, or the story of Reba outrunning a turbulent childhood 60 years later, I stayed up 'til all hours wielding my flashlight to read "just one more chapter". Everything all sort of comes together in one of those "it's a small world" scenarios at some point in the book. I found McCoy's writing both enthralling and comfortable, and this book is like an old friend now. I know that's pretty vague, but I don't want to give anything away. Immerse yourself in the world's of both Elsie and Reba, their friends and family, and the warmth of a good bakery emanating from beyond the pages! 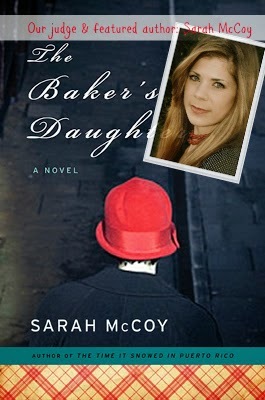 Our judge for this round will be none other than the author of The Baker's Daughter, Sarah McCoy! Since reading The Baker's Daughter for the first time, and writing a post, I've found that Sarah is incredibly kind and generous...and just a regular, old girl (you know, aside from the talented author bit). We both watch Downton Abbey (okay, who doesn't), and enjoy drooling over some good food. She's also been busy working on her third novel, which I can't wait to get my hands on. So, when I decided that I really wanted to feature this book for a round of CTB, I knew I wanted to ask her if she would have the time to judge our submissions. And as you can probably guess: she said yes! Let's make her proud. Thank you, Sarah ☺. Submissions for this round of Cook the Books will be due by Monday, September 30th. Please enter your submission in the linky tool below (if you have problems, feel free to leave a link in the comment section of this post). 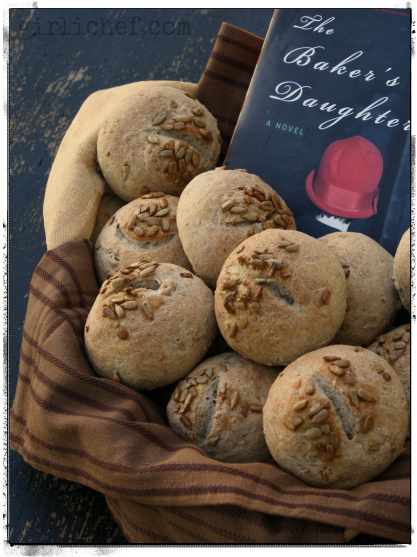 I look forward to seeing what The Baker's Daughter inspires you to make! I'll be gathering all of these links in anticipation of a big roundup after the submissions close (check back after 9/30 for that roundup, and then the judging)! 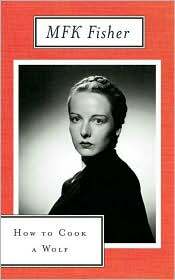 Being not only a fan but a friend of MFK Fisher, I was totally delighted and truly grateful for this opportunity to peek in on her once again in the company of such fantastic writers. As noted in Eliot's Eats, who knows what Fisher might think of blogging considering her famous “snarkiness” at anything overly trendy. “The cuisine was good,” she once commented about a meal at one of San Francisco’s trendy restaurants whose chef had served each course atop its respective painterly sauce; “definitely the Puddle School from start to finish, but all very fresh and good as well as stylish.” In her personal lexicon, the single word stylish was death. But I do know that no one appreciated good, clear, sensuous writing more than Mrs. Fisher; and that, in abundance, is what we have here in these Cook the Books essays. I suspect that the quality of the writing might be enough for her to forgive any offending trendiness. However, you people didn’t do me any favors giving me such an embarrassment of riches from which to choose. Your discussions both of Fisher's menus and of her message showed such sensitivity and appreciation of them in the context of their original intent. Everyone took liberties with the literalness of the recipes, which is exactly what she would have done. And in fact, that's what she did do as witness her comments on her own comments a decade after the initial publication. Best of all, all the Cook the Books riffs were delightful. Girlichef: I really loved the way the essay learned from itself and expanded into something other than how it started out. Girlichef's observations and openness to experimenting ("I’d never eaten sweet-ish pasta…and needed to remedy that immediately") made for an evolving adventure. Beautifully written, it sparkled with touches of humor, and the final insight is a lesson for us all: "I look forward to inviting the chaos into many more meals." 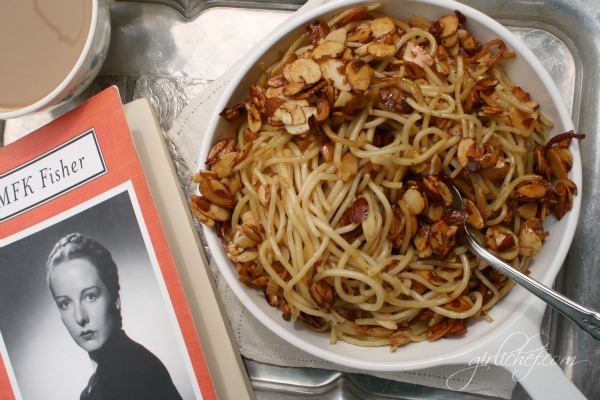 And I look forward to actually making that spaghetti with almonds in cinnamon honey butter. Who knew? Sweet Almond Tree gave us a sober sense of moment with its reality check on living in wartime. The personal nature of her references lent a particular poignancy to her observations; yet the piece is alive with occasional humor (the "polenta guru," the christening of Socrates ("a righteous dude")). And her summation of Fisher precepts is a cogent synthesis of the whole book. 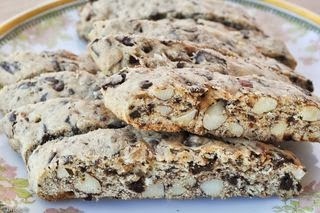 The story and the recipe for Strapasada were so compelling that, the afternoon I read it, I actually changed my dinner menu in midstream! So I guess that means two winners for the wonderful Wolf roundup with extremely honorable mentions all around. And again, thank you all for involving me in this fun and soul-satisfying project. A big Thank you! to our judge for her thoughtful and delightful words. Looking ahead: Our current selection (soon to be formally announced by Heather) is The Baker's Daughter by Sarah McCoy. First came the announcement, then the reminder, then the deadline and now it's time for the roundup of Cook the Books' June-July 2013 edition for which we read How to Cook a Wolf by M.F.K. Fisher (1942). For each contribution (given in order of publication), I will give you the official information (author, blog name and post title) and a brief quote from it — a tiny morsel that will entice you to follow the link and read the details not only of the dish prepared, but also of how the reading inspired the activity in the kitchen. Now, please, make yourself comfortable, then follow me on a little literary / culinary journey on the wings of M.F.K. Fisher's delightful prose. 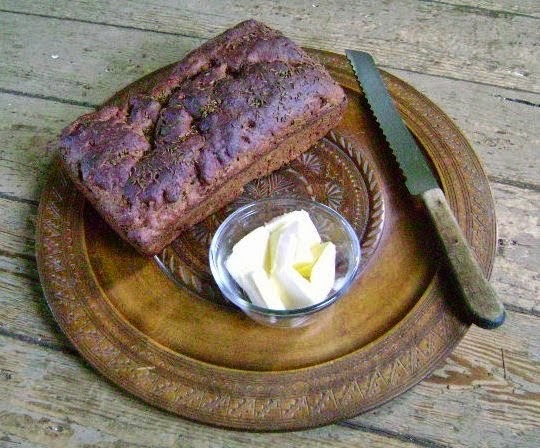 "Growing up we had several apple trees and my mother, another ingenious cook who made miracles with meager supplies, would use the fruit so many different ways. She made our applesauce, apple tarts, pies, roasted apples with pork and of course… baked apples. 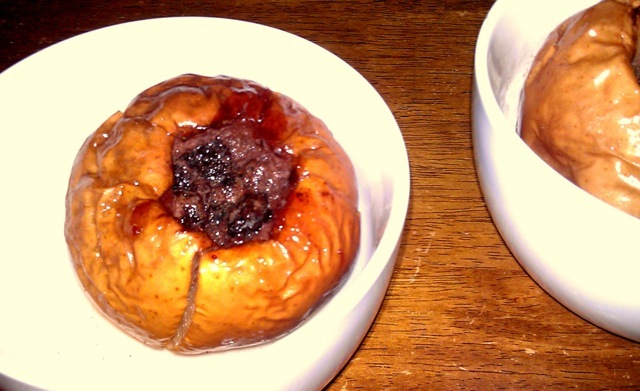 My father slathered the baked apples with way too much vanilla ice cream. " "In the “original” recipe MFK Fisher states “…butter (no compromise here)” so I didn’t reach for my olive oil as I usually would. Oh my. I’d almost forgotten how onions smell cooking in butter. 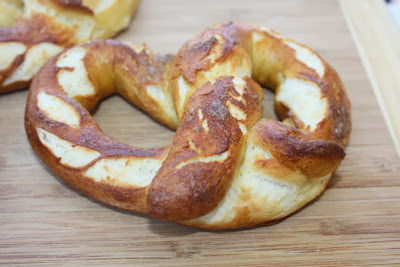 Wowza… Oh and I used Yukon Gold potatoes. Mmmmm, buttery!... That’s it! 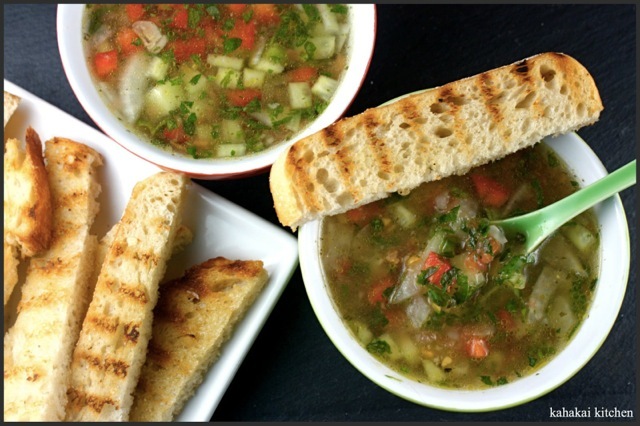 Simple, tasty, filling, and good hot or cold." "I love the "herby" taste of this version of gazpacho--the tomatoes and juice are a player in the soup but unlike many gazpachos, the herbs really are the star here. 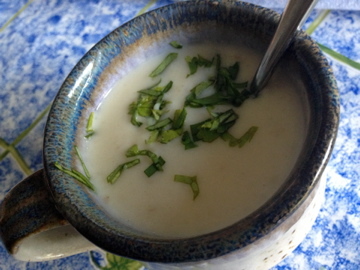 This is a great soup to make after a trip to the farmers market. The freshness of the local ingredients adds a lot to the flavor. I think it tastes best after at least a day--allowing all the flavors to meld." "This homegrown cauliflower was about half the size of my St. Bernard mix, and I wacked up the flowerets for an Indian-inspired cauliflower curry. 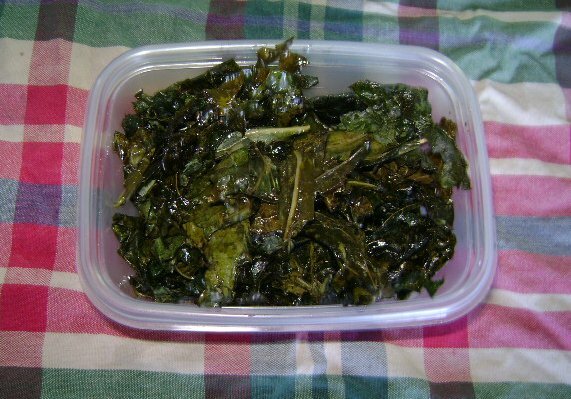 However, my latest issue of Mother Earth News contained a short article about the edibility of cauliflower and broccoli leaves, and in the spirit of wolf banishment, I decided to experiment with them instead of consigning them to the compost heap." "I'm utterly enamored with and utterly confused by this dish all at the same time. When I read the line "Ah, spaghetti baked with honey and shaved almonds in a buttery dish!"... I knew that I'd never eaten sweet-ish pasta...and that I needed to remedy that immediately. The scent reminds me of those stands at the fair that sell warm, freshly sugared nuts in cones. I can't resist those, either." "But, let’s consider the egg for this post. Her chapter, “How Not to Boil an Egg,” is poetic. 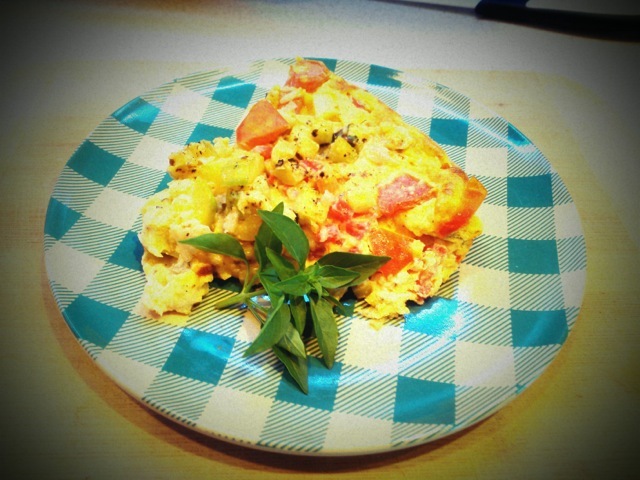 She writes that the egg is the most private of things; that is, until it is cracked... She continues to write about the best way to eat a fresh egg: raw, boiled, fried or in some spectacular main dish like this frittata. I am picking zucchini daily so my choice for this post was easy." 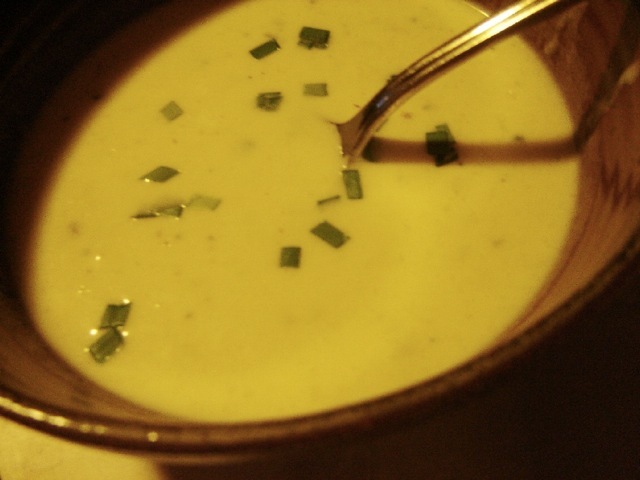 "It was hard to choose a single recipe, from such a plethora of excellent options, but one which I think captures that period of privation is potato soup, basically potatoes and onions. Then you add the slap in the wolf's face, a bit of cream, and say, "Ha ha, you haven't beaten me yet." And enjoy your meal while he slinks away into the night. "If beans were luxury eating for my relatives during World War II, polenta was their staple meal. They would eat polenta nearly every day... My grandfather was the polenta guru of the clan, cooking it over an open fire in the yard, and stirring it all the long time it needed to be stirred. Then he would take it to my grandmother who poured it onto a platter and flavored it either with petimezi (a syrup made from grapes), or with feta cheese. 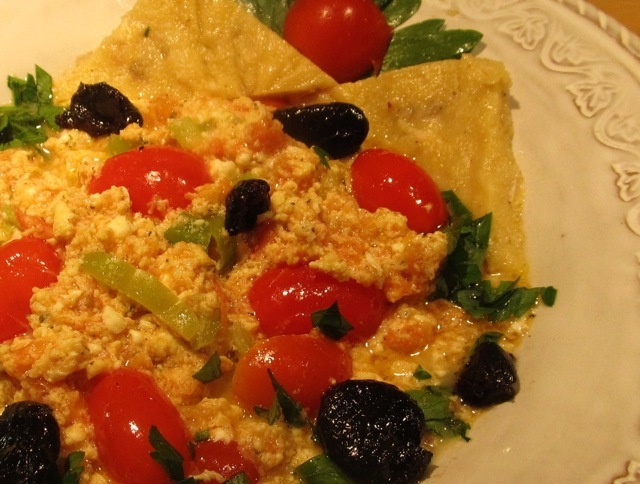 Polenta made either sweet or savory." 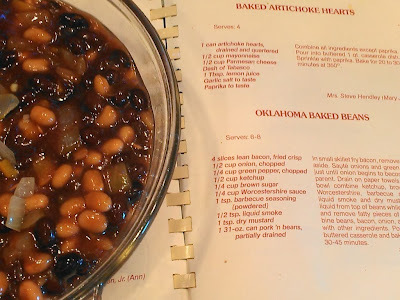 "In the chapter "How to Comfort Sorrow" there is the famous War Cake, in which bacon grease can be used, "because of the spices that hide its taste." I was never tempted to try it. The recipe that follows, on the other hand, Tomato Soup Cake, sounded quite intriguing... As the name suggests, tomato soup is one of the ingredients of the cake. Please, suspend your disbelief. 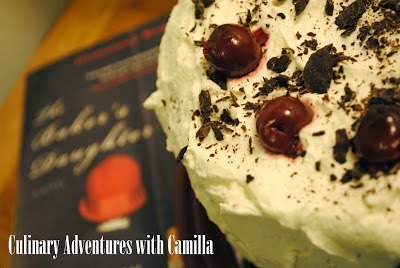 Read the recipe and my experience realizing it, and then decide for yourself whether you want to give this cake a try." We will give our judge Jeannette Ferrary some time to read the posts and come up with her decision. Then, I’ll be back with the announcement of our winner of the coveted CTB "winner’s badge." 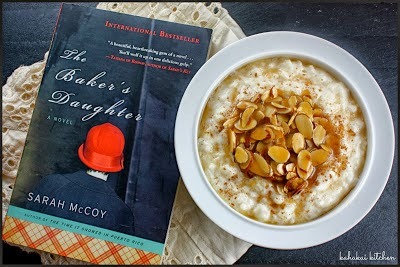 And after that, I’ll turn things over to Heather for our next pick The Baker's Daughter by Sarah McCoy.